We have just returned from spending two weeks in Scotland following our noses but without any predetermined plan, least of all finding previous owners of our camper van, and this led us to the Isle of Arran. There we spent a wet hour or so in the seaside town of Lamlash. 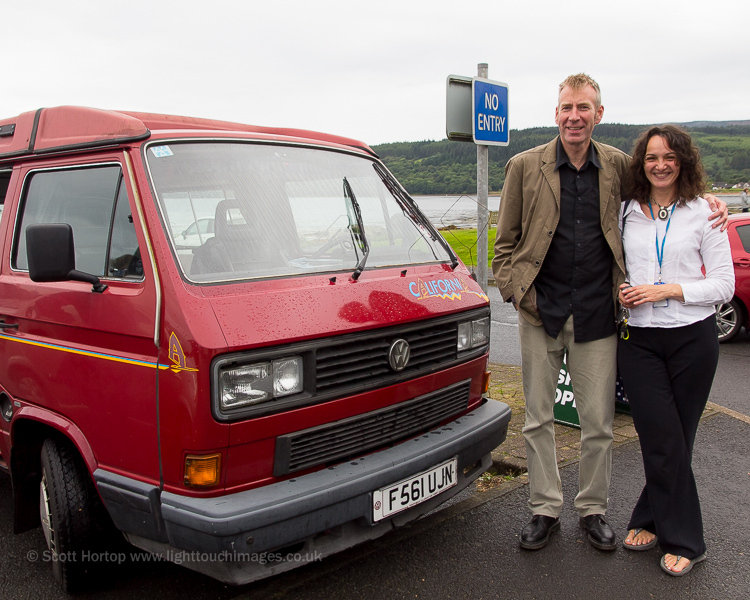 We had just parked on the seafront when up walked a couple who joyously called out "That's our camper" - as if by magic it had returned to its first UK home and its owners Greg and Heather who were so pleased to be reunited with it. One of the first things they noticed was that the number plates, front and rear, still bore the message "Gabrielle and Joley on tour", and although there had been three owners since, it was still more or less as they will have sold it on. What was extraordinary is that for a short period the camper slept six! Their two girls, Gabrielle and Joley, were in the pop up 'upstairs' with the baby in a carry cot sleeping on top of their cooking unit with their labrador sleeping on the floor. It was really good to meet Greg and Heather and find out a little more of the camper's history. I knew that the original UK owners of our camper van lived somewhere in Scotland but did not have a clue where. Other UK owners have lived in Devon and London and I am not sure how many owners there were in Germany before it came to these shores. I guess that if you are a vehicle that tours and lives long enough then you are occasionally going to get reunited with previous owners, but this was quite a far flung encounter of a quite personal nature, and all the better for it. I have just put the first few of my photos of Isle of Arran online. Lots more to come from Scotland over the coming weeks even if nothing has a story like this to go with it!